Felix Nadar was a French photographer and balloon enthusiast who took the first aerial photograph from a balloon in 1853. Ten years later, he commissioned the construction of the world’s largest balloon, and enormous project that kept nearly 200 women busy sewing silk for a month. Le Géant (the Giant) stood 60 meters (196 feet) high when inflated, and could lift at least 30 people, as was once demonstrated. The elaborate wicker carriage comprised two storys and several furnished rooms, plus an observation deck on top. The balloon flew well, but had trouble landing. Its first outing ended in the carriage being dragged along the ground, but the balloon survived. On its second outing, Le Géant lifted off with nine people aboard in front of a crowd estimated at half a million people. 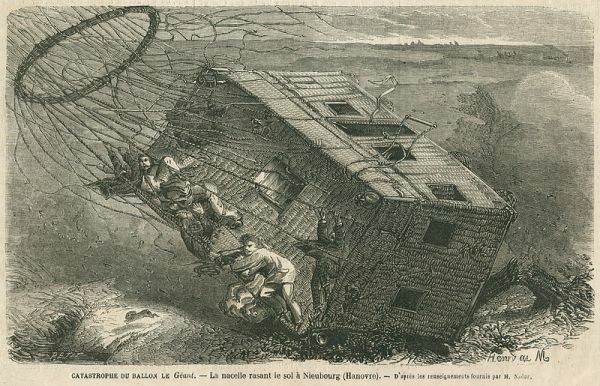 It flew 400 miles, to Hannover, Germany, when Nadar decided they should land.